Home maintenance is essential for keeping your home safe and in good working order — but that doesn’t mean it comes cheap. Scheduled service, supplies, and repair costs can all add up. But it’s worth the investment: properly maintaining your home means prolonging the life of major systems and appliances, and keeping your family and home safe by identifying issues before they become a serious problem. But how much exactly is this annual maintenance cost? Experts say that it’s 1% of your home’s value. That means if you own a home worth $250,000, you’re likely to spend about $2,500 in maintenance and repairs each year. Is this more — or less — than what you’d expect to pay? 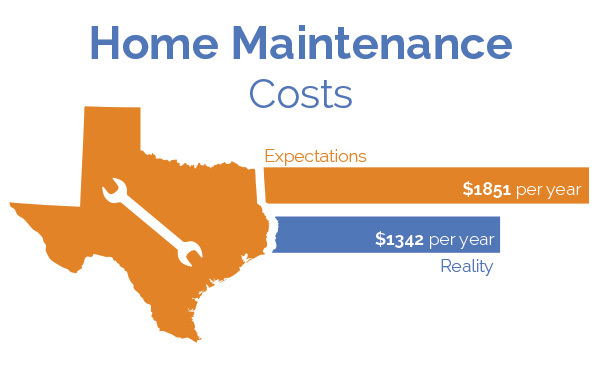 We asked Texans between 25 and 34 years old what they would expect to pay in home maintenance costs per year for a home with a value of $134,200. On average, the cost to maintain this home would be $1,342 per year, or, 1% of its value. But surprisingly, Texans overestimated the cost by more than $500, with an average answer of $1,851.82. That means Texas are overestimating home maintenance costs by 37%! This is good news for Texans: properly maintaining your home may cost less than you think. That means there’s no excuse for staying on top of basic upkeep of your home, including air conditioning and furnace inspections, tree trimming, gutter cleanings, and roof inspections and repairs. Our survey shows that among people in urban areas, those earning $0-24K answered higher on the scale than those earning $50-74K. People earning $0-24K expected to spend $2,661 on home maintenance per year, while those earning $50-74K expected an average of $1,981. Interestingly, both urban groups expected to pay more per year in maintenance costs. This higher cost estimate for lower income home owners is common even outside of urban areas, with people earning $0-24K answering higher on the scale than those earning $25-49K. Earners of $0-24K expected a cost of $2,233, while those earning $25-$49K expected $1,634. In reality, home owners with a lower income may truly pay more for home maintenance costs. Why? Low income home owners on a tight budget may put off important maintenance and repairs more often than those with a higher income and a greater ability to stay on top of home maintenance. That means issues like roof leaks, air conditioning repairs, or deteriorating exteriors left unaddressed may grow to become bigger, more expensive problems instead of being taken care of on time and at a lower cost. While the cost to maintain a $134,200 home may be $1,342, with a home warranty service contract, it could be even less. The average price of a warranty is $450 per year — significantly lower than the average maintenance cost and much lower than the $1,851.82 that most homeowners in Texas expect to pay each year. Though home warranty service contracts do not include regular maintenance like HVAC cleaning, roof inspections, or tree trimming, they do include important repairs on well maintained systems and appliances, including air conditioning, plumbing, hot water heaters, and kitchen appliances. The Choice Home Warranty survey asked respondents aged 25-34 in Texas “On an average-aged $134,200 valued home that you own, how much would you expect to pay in home maintenance costs per year?” using the Google Consumer Surveys tool. The survey ran in October 2014. Results are weighted by inferred gender, age and geography to reflect the population.